IAS officer and District Collector of Mancherial, R.V. Karnan recently ‘rescued’ a 48-acre heritage lake from being encroached. Although the lake has been in the heart of the town for over 50 years, several attempts have been made to encroach on it and build a commercial complex. However, eager to increase the city’s lung space and preserve natural resources, the IAS officer has gone all out to protect it. After the irrigation authorities identified the full tank level (FTL) of the lake, the district administration fixed boundaries for it. “This helped us to identify the area that is within and outside the tank,” explains Karnan, who also started an awareness campaign to show how the tank can help store rainwater while saving colonies from floods. 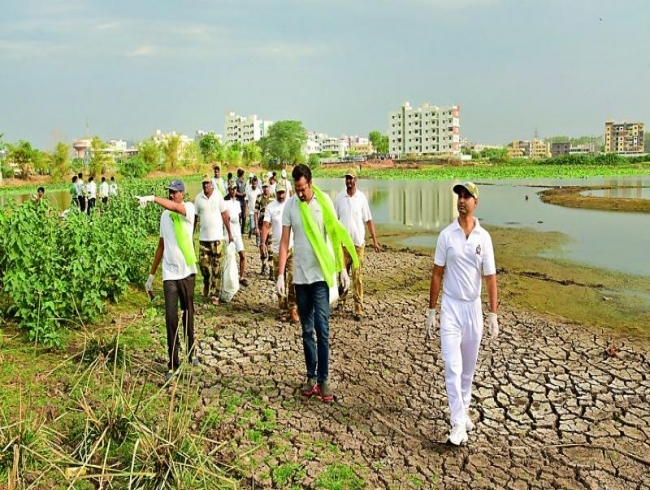 “With the help of volunteers, hundreds of students, TSSP 13th Battalion personnel, Singareni workers and residents, we removed plastic bags, filth, weeds and waste plants from the lake to protect it from pollution,” states Karnan. Interestingly, while the forest department provided the machinery, Singareni workers and police personnel voluntarily participated in the lake cleaning drive. The authorities have also created a walking track adjacent to the lake. “Within another six months, the entire surrounding lake area will also come into use. We are looking to build a cycling track, proper fencing, children’s park, yoga centre, etc. We have already submitted the proposal to the government for renovation and beautification of the lake. We want to convert it into a recreational destination for the town,” he says. Surprisingly, the lake has become a hub for 20 species of water birds. “The forest department has identified various species of water birds including Jacana, Cormorant, Coot, Black-winged Stilt, Pond Heron, Moorhen, Purple Heron, Kingfisher, ducks, etc., that have become migrants here,” reports Karnan, while calling for active citizen participation in such programmes.